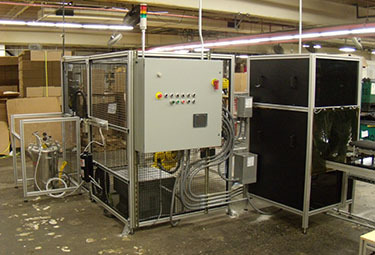 Descher designed and integrated its solution around a modular palletized conveyor system and a 6-axis robot with custom EOAT plumbed to a precision dispensing nozzle. 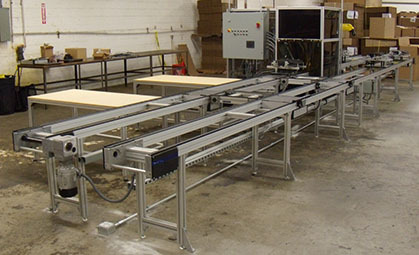 The conveyor is arranged in a multiple-loop format to allow for several load-and-unload configurations, and coupled with modular fixturing the system is capable of nearly instantaneous change-over. 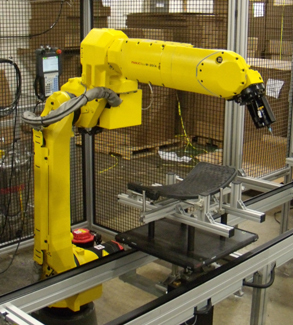 Further, through RF tagging of the pallets, the robot can ID seat types and modify gluing paths on-the-fly, yielding a highly flexible system tolerant of timing variations in the upstream sub-assembly queues. 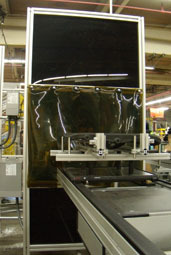 To satisfy the adhesive curing requirements, Descher integrated an on-demand timed LED system which potentiated significant power savings over traditional curing lamps.